Almost two months ago, I crossed the finish line of the Twin Cities 10 Mile in downtown St. Paul. Now that enough time is passed and my face is finally unfrozen, I can tell you all about it! A year ago, when my cousin and I crossed the finish line of the TC 10k, I saw the bright shiny medals for the 10 mile and marathoners and instantly wanted one. One could almost say I coveted it. We all know my love for shiny sparkly things, so this should come as no surprise. So I set off to train and finally receive one. I strategized and did the TC 1 mile in the hopes of winning a spot in the 10 mile. And I did. I still have the screen shot of that email saved on my iPhone. What a great day that was! My dreams of earning a medal finally came true after a year of training and after blisters, a newfound love of running skirts and braving the cold wind of Lake Calhoun at 5 am, I got my medal. I've written a couple times about this running journey on this little blog but this time, I had big fish to fry. Alice and I had been training in cold weather for about three weeks before the race, but nothing hits you harder than a 17 degree wind downtown Minneapolis at 6:30 a.m. while you're standing in corral 1 (which, how in the heck was I chosen to be in the first group?!) waiting for 7:09 when the horn blows and you have to take off. Needless to say, I did it. Not without being so cold, I missed my mouth at the first water stop and spilled an entire cup of blue Gatorade on myself. In a white shirt. The entire race, I thought everyone was staring at me in horror. "Look at that crazy girl with the blue-stained shirt! She's crazy!" I was a little crazy! What kept me going? That medal but also the people at the finish line waiting for me. Last year, my grandparents drove from South Dakota to see me at the finish line of the 10K. Which my Gram told everyone in their hometown was actually a marathon. If that doesn't boost your confidence, I'm not sure what will! This year, they were at the finish line again and she was sure to tell people that this race was 10 miles but that's basically like a marathon (just minus 16.2 miles is all). I crossed the finish line and spotted my Dad with iPhone posed and ready to take those coveted finish line shots. I saw my grandparents clapping and my Mom beaming. And I pretty much lost it. I wanted to hug the person who gave me my medal. I wanted to kiss the person who gave me the heat blanket. And I wanted to high five the person who gave me my finishers t-shirt. Emotions were high and that smile in front of the banner? Totally, 100% genuine endorphines. Amazing. 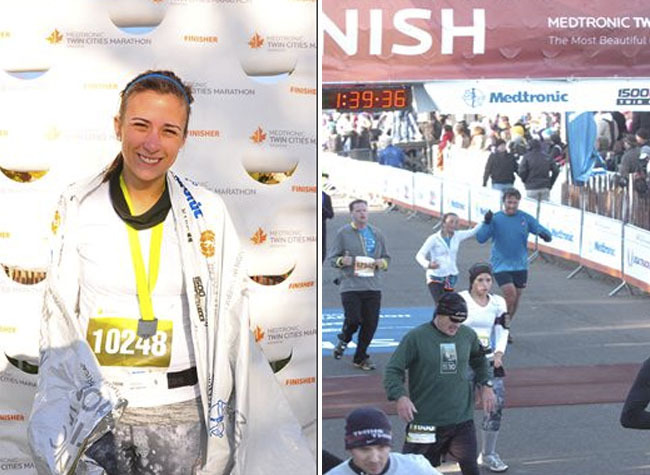 I'm not sure why, but the TC Marathon peeps chose that photo of me to advertise the race photos in an email. I almost choked on my protein shake when I saw that! What an honor! Best moment of the race experience? When my Dad stole my medal the next day and had it engraved with my finishers time: 1:32:46 and "Great Job Syd." I look at that medal every morning and grin. A major part of this running experience that has kept me going is the support and encouragement I've received from all of you - the high fives and the hugs and the compliments and the emails and congratulatory text messages and tweets after every race. When I'm up at 5 am and putting on all these layers and crazy socks with hearts and chevron stripes and leopard spots (thanks, Target! ), I remember your words and that's what gets me out there. 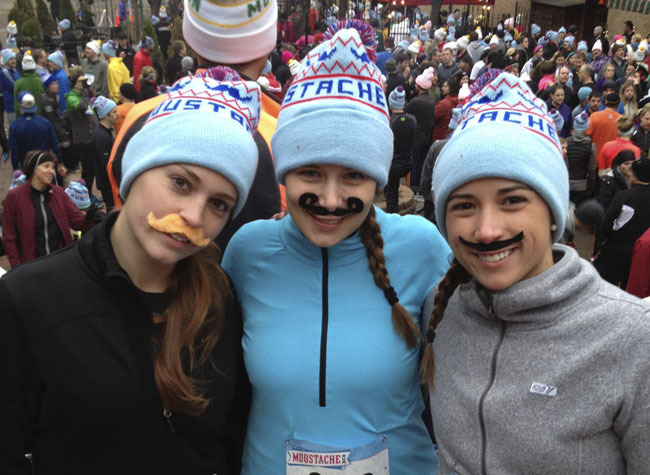 Plus, the thought of wearing a moustache during a 5K with your friends is pretty awesome! I run not only to feel better, to finally have reached (and crushed!) my goal weight after 3 years of workouts and training sessions, to fit into those jeans I never would have dreamed would fit, but I run because I want to stick around. I've been so blessed to live this life - a life I dreamed about living for so long - that I want to enjoy every second of it. I want to be that photographer who's 65 and still working as hard as when she was 25. I don't want to look back and wonder what if. I want to keep making goals and checking them off my list. Goals and dreams are different for all of us. Mine are different from yours, but maybe they're similiar. Either way, I want to support you in your dreams too! This post is the beginning of a series of personal posts that come straight from my gold glitter heart. And I encourage you to respond in the comments section with whatever your goals and dreams are - let's talk about them! Let's be encouragers of each other and hopefully, we'll make 2013 the best year yet. In 2013, I will run a marathon. I'm making this declaration here and now. What will YOU do in 2013 that you've never done before? One of my 2013 brides, Meaghan, was gracious enough to offer a discount code for this race on January 1, 2013. I'd love to hear what you're making a commitment to in 2013, so leave a comment on this blog or the Facebook page and next Monday, I'll choose 3 winners! Join us in making a commitment to a healthier lifestyle!